In a traditional round cut, the Hearts On Fire diamond is a brilliantly performing, ideal-cut diamond, that makes a timeless and elegant statement no matter how its worn. Similar in brilliance and intensity, the Dream diamond is the only fancy-shaped diamond that can meet the high-quality standards set by Hearts On Fire – in a modern and elegant square frame. Due to its unique design, only a few dozen master diamond cutters in the entire world have the skills necessary to cut a Dream diamond. Different than a classic Hearts On Fire round diamond (which has 58 facets and returns approximately 98% of light), the Dream cut has 70 facets and returns approximately 93% of light. This is one of the highest light returns for any fancy shaped diamond. 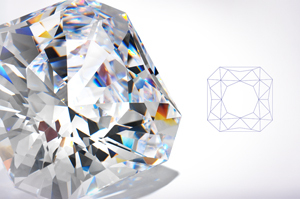 In fact, its unique performance and design are so exceptional that the Dream diamond was granted a U.S. Patent. As radiant as it is unique, this diamond truly is a dream.